All this week, social media timelines, television viewing and news outlets will be flooded with praise, retrospectives and syrupy-sweet tributes to Barack Obama, lamenting the end of his tenure as president of the United States. I can already tell you that there will be a “speck of dust” caught in my eye all day on Jan. 20. But my teary eyes won’t only be for the last moments of America’s first black president. They will also serve as tribute to the unheralded legacy of Obama’s ride-or-die, best friend forever and No. 1 ally: Uncle Joe Biden. You might only know Joseph Robinette Biden from his thugged-out black Twitter memes, or from when he almost caught the Holy Ghost as he was presented with the Presidential Medal of Freedom, but as a political junkie, I have long been a Joe Biden fan. Before a young, charismatic, black Illinois state senator named Barack Hussein Obama stepped onto the national political stage, Biden was one of my favorite politicians. His unfiltered style had already put him ahead of Hillary Clinton as my choice for president before Obama threw his own hat into the ring for the prize of the 2008 Democratic presidential contest. Long before he stepped up to serve as Obama’s vice president, Biden was already the conscience of an increasingly divided Senate, using his seniority and charisma to bridge the gap between the left and the right. He fought both Republicans and Democrats and stood as a nonpartisan voice, reminding his fellow politicians to do what was right. Biden was “unapologetic” before it became an overused catchphrase. I’ve been to Afghanistan, I’ve been to Iraq seven times, I’ve been in the Balkans, I’ve been in these foxholes with these kids, literally in bunkers with them. Let me tell you something, nobody asked anybody else whether they’re gay in those foxholes. Our allies—the British, the French, all our major allies—gays openly serve. I don’t know the last time an American soldier said to a backup from a Brit, “Hey, by the way, let me check. Are you gay? Are you straight?” This is ridiculous. This was before the Democratic Party made gay rights part of its party platform; before Hillary Clinton or Obama had accepted the changing tide of American opinion. And he didn’t say this in a private interview or to a pandering crowd—this was during a political debate. Biden voted to add sexual orientation to the definition of hate crimes in 2001 and voted to prohibit job discrimination based on sexual orientation in 1996. The white citizens were almost all happy to have the guard there. They were afraid riots might ignite in the ghetto and spread. They were afraid Wilmington’s police force wasn’t big enough to keep it contained. In the black neighborhoods of East Wilmington, residents were afraid. Guardsmen were prowling the streets with loaded weapons. Curfews were in effect. The news had a way of making these stories seem like a conversation between the races, but I knew blacks and whites weren’t talking to each other. Because Joe has been down with us. If Obama was black America’s surrogate father figure, then Biden was our uncle. Biden is the uncle who always acts up at the cookout but makes sure you don’t mess with anyone in the family. He might embarrass you in public sometimes and say inappropriate things at the Thanksgiving table, but you know he will be there when it’s time to throw down. When Obama became president, we knew there was one land mine he needed to avoid at all cost. If Obama wanted to wield his political capital and use it to bring the country together, he could never become the “Angry Black Man.” Obama knew this. Even first lady Michelle knew this. So Biden served as Obama’s de facto anger translator. Your uncle Jerome and Joe Biden. 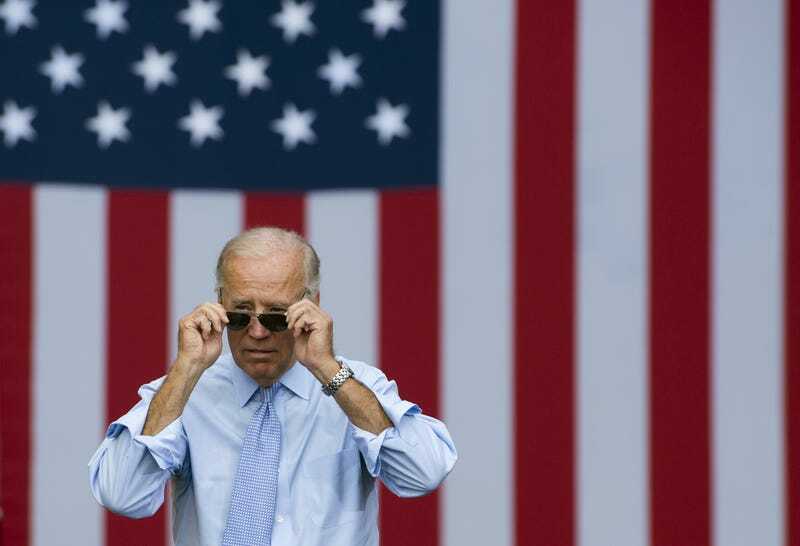 As the curtain closes on the Obama administration, we salute and thank you, Joe Biden. Thank you for 45 years of public service. Thank you for your allyship. Thank you for giving Obama cover and a BFF. Thank you for your protection of the first family. Thank you for the exponential strengthening of black Twitter’s meme game. We love you, Uncle Joe. We’ll see you at the cookout. But we still won’t eat your potato salad.